2. Meanwhile, put the fruit, sugar, lemon juice and 100ml water in a pan; bring to a simmer. Cook for 2 minutes, until the fruit starts to collapse. Cool a little, then strain through a sieve into a jug, pressing the fruit with the back of a spoon to extract the juice. Pour into an ice-cube tray and freeze until solid, ideally overnight. 3. 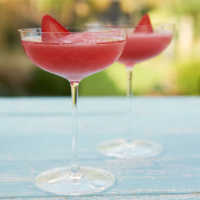 To serve, pour the semi-frozen wine into a blender with the Campari and ½ the fruit syrup ice cubes. Blitz until fairly smooth, then taste and add more Campari or ice cubes, blending until the mixture is smooth and thick, like soft sorbet. (Keep any leftover ice cubes for another day.) If it melts too much, return to the freezer for 30 minutes and blend again briefl y. Serve immediately in small wine glasses or champagne coupes, garnished with the strawberry slices. This recipe was first published in Thu Jun 01 14:42:00 BST 2017.